This Veterans Day, restaurants are saluting veterans and active-duty military by offering free food and meal deals. 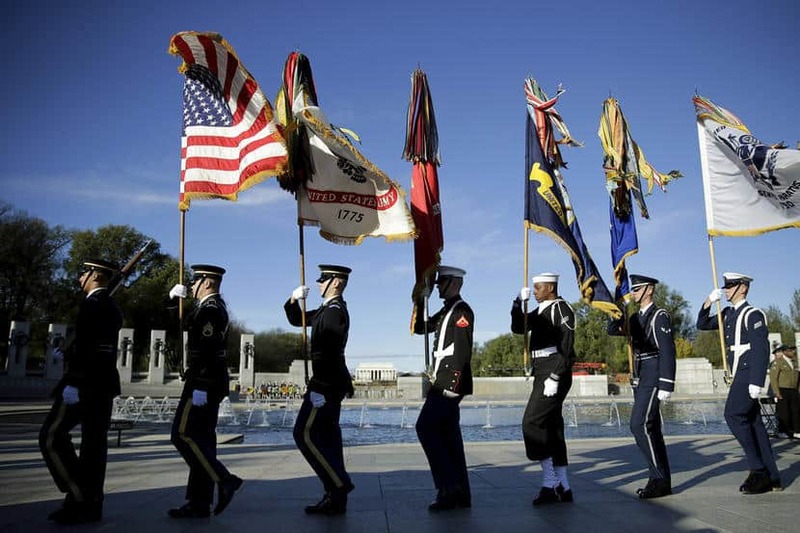 Thanks to the federal holiday falling on Sunday (learn why Veterans Day is marked on the same day each year) it is officially observed today, Monday, November 12. This gives all of us an extra day to show our appreciation to service men and women across the country. Furthermore, it gives businesses an opportunity to carry the appreciation and savings into the week. Deals are available at participating locations. Offers can vary so check with your closest location to confirm. The businesses listed here have more than 20 locations. Many smaller chains and individual restaurants also will offer deals. The easiest way to find specials is by checking social media. Another Broken Egg Café: Free Patriot French Toast Combo and coffee Monday. Ben’s Soft Pretzel: Free regular Jumbo Soft Pretzel 11 a.m. to 7 p.m. Monday. Black Angus Steakhouse: Special top sirloin steak meal for $9.99 Monday. Bruegger’s Bagels: Free drip coffee Monday. Burgerim: 50 percent off Monday. Chicken Salad Chick: Free Chick Special and regular drink to veterans and active-duty military Monday. Claim Jumper: Free meal Monday. Country Kitchen: Free Country Scramble Monday at participating locations. Denny’s: From 5 a.m. to noon Monday, active, inactive and retired military personnel get a free Build Your Own Grand Slam at participating locations. Famous Dave’s: Free two meat lunch combo Sunday and Monday for veterans or active military with valid identification. Farmer Boys: Free Big Cheese cheeseburgers Monday. Fatz Southern Kitchen: Free World Famous Calabash Chicken Basket Monday. Plus, in November active military and veterans get 25 percent off entrees. Gigi’s Cupcakes: Free cupcake Monday for veterans and first responders. Hopdoddy Burger Bar: Every location will give 50 percent off to veterans, active military and their guests Monday. Hoss’s Family Steak & Sea House: Free salad bar and dessert 11 a.m. to 9 p.m. Monday. Or buy a meal and add on the salad bar for free. Huddle House: Free order of Sweet Cakes through Monday. IHOP: Free Red, White and Blueberry pancakes from 7 a.m. to 7 p.m. Monday or a free patriotic pancake combo. Offer varies by location. P.F. Chang’s: Free entree with purchase of another entree, proof of service and coupon Monday. Find the coupon at www.pfchangs.com. Potbelly Sandwich Shop: Free cookie with any purchase Monday. Ovation Brands: Free buffet and bottled water at Old Country Buffet, Ryan’s, HomeTown Buffet and Country Buffet and Furr’s Fresh Buffet Monday. Rock Bottom Restaurants & Breweries: Vets eat free Saturday through Monday. Also, each brewery will be brewing a limited-edition Veterans Day IPA and Saturday through Nov. 17, 25 cents from every pint will go to a local veterans charity. Rock & Brews Restaurants: Free meal from select menu for veterans, active military and first responders Monday. Sonny’s BBQ: Free pulled or sliced pork big deal combo for veterans and active duty military Monday. Dine-in only. Twin Peaks: Free meal from a special menu 11 a.m. to midnight Monday. Cinemark: Free tickets Monday to veterans, active-duty and their spouses for Universal Pictures’ movie First Man at more than 60 locations nationwide. Hair Club: Free haircuts to veterans and active military personnel in honor of Veterans Day for the month of November. Also get half price off select hair restoration solutions through Nov. 30 — this offer is also available to first responders!